Anacyclus Pyrethrum (also called Akarkara) is Indian Medicinal plant used in ayurvedic, Unani and herbal medicines worldwide for the treatment of men’s diseases, common cold, toothache and pyorrhea. Anacyclus Pyrethrum or Akarkara has libido stimulant and aphrodisiac properties, so it improves physical strength and performance during physical contact. 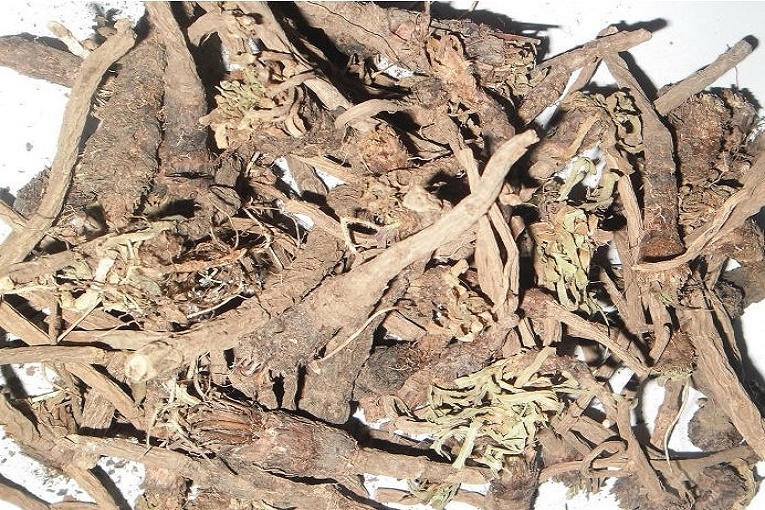 Plant Root is main medicinal part of Anacyclus Pyrethrum (Akarkara). Anacyclus Pyrethrum (Akarkara) has following healing properties. Primarily, Anacyclus pyrethrum is libido booster and aphrodisiac. Anacyclus Pyrethrum (Akarkara) is helpful in following health conditions. Anacyclus Pyrethrum (Akarkara) is mainly beneficial for men’s problems. It helps treating all above diseases given in therapeutic indication section of this article. Here are some main medicinal uses and health benefits of Anacyclus Pyrethrum (Akarkara) are given underneath. This mixture has potent libido stimulant action. Kaunch Beej (Mucuna Pruriens) and Musli can also be added in above combination. Akarkara efficacy reduces after a few weeks if it is used alone. Therefore, it should be used along with Ashwagandha (Withania somnifera) and Kaunch Beej (Mucuna Pruriens) powder for maximum benefits. The gargle with Akarkara water is also helpful. For this, boil 10 grams Akarkara root in 250 ml water. Gargle with this water to get relief from pharyngitis. It is also beneficial for toothache and gum diseases. A gentle massage of Akarkara root powder with Camphor helps in toothache. It is also used with black pepper, Ajwain Khurasani (Hyoscyamus Niger) and Vaividang (Embelia ribes) for reducing toothache. Akarkara root powder is mixed with mustard oil and used in the treatment of pyorrhea. A gentle massage of tongue with 125 mg of Akarkara root powder mixed with honey helps improving speech in children. Its effects potentiate when 125 mg Vacha (Acorus Calamus) is also added in this mixture. Take a pinch (about 125 mg) fine Akarkara Powder and mix it with 1/2 tsp. honey. You can also add a pinch (about 125 mg) of fine Vacha powder in above mixture. Now, apply the paste on tongue, move the index finger on the tongue slowly and do a gentle massage for 2 to 5 minutes. Now, ask your child to ingest the same honey based mixture used for oral massage. Internal intake is also safe and healthy for the brain and vocal cord. It also increases memory and intelligence. Rinse the mouth with normal water. Repeat it every day (especially in the night just before sleeping) until you see desired improvement in the voice. However, you can do it twice a day, but once a day would be sufficient and reported helpful. Brush the teeth properly before doing the Akarkara oral massage. It would be better if your child can do massage himself and you just require teaching the technique. In case, the child is not able to do so, you can do this. Just remember, some may feel vomiting or nausea sensation when your finger touches the lower end of the tongue. It is natural and likely safe, but you should try to avoid this. Akarakara and Vacha both are LIKELY SAFE with this smaller dose. This is also useful to improve overall functions of the brain. Therefore, we asked that child should swallow it after the massage. In ayurveda, Anacyclus Pyrethrum (Akarkara root) is used as adjuvant in management of epilepsy and seizures. Studies have shown that its root extract has protective action, so it may help preventing seizures. The following herbal combination used in ayurveda prevents epileptic attacks. This is a single dose. This Akarkara mixture should be taken twice daily and for at least 4 weeks. The dosage of Anacyclus Pyrethrum (Akarkara) varies according to age and health conditions. The maximum dosage of Anacyclus Pyrethrum should not exceed from 4 grams a day. The safest dose of Anacyclus Pyrethrum is 250 mg to 1000 mg twice a day. Anacyclus Pyrethrum (Akarkara) is POSSIBLY SAFE if you are not suffering with burning sensation, gastritis, ulcer, acidity and inflammatory bowel disease. Higher dosage and unwise use of Anacyclus Pyrethrum (Akarkara) can lead to following side effects. Anacyclus Pyrethrum (Akarkara) is not suitable for long-term use. Its aphrodisiac effects are reduced when it is used for long-term basis. Short-term use varies from 1 to 4 weeks is POSSIBLY SAFE. Anacyclus Pyrethrum (Akarkara) can induce uterine contractions and stimulate menstrual flow or uterine bleeding. Therefore, it is UNSAFE in Pregnancy. Akarkara can also reduce milk flow, so it is also UNSAFE in breastfeeding. You should not take Anacyclus Pyrethrum (Akarkara) in following conditions. you said Akarakara is good in childhood apraxia. Also one massage with honey is mentioned. Please explain massage what ?? neck or some other body part.. Updated, please check same heading above in the article. Hi, Thanks for the updation in Childhood Apraxia. Please clarify me on the following points. How to give tongue massage to a child? Please explain the complete procedure, duration, after massage should be washed with water or something else? For how many days it is to be done ? Is akarakara powder and vacha powder safe for children? Child will easily swallow these if applied on tongue. We have updated the section. I hope it would answer your all questions. If you do have any other questions, please suggest us. Does anacyclus pyrethrum help in erectile dysfunction? Does it increase testosterone level? In ayurveda, Anacyclus Pyrethrum is great remedy for ED (erectile dysfunction). Now modern studies also suggest similar activities of Akarkara. According to various studies on animals, it increases testosterone level in the blood and has anabolic effects on the body. I’ve read an article of akarkara benefit in a book. There they describe that – take Akarkara root powder with yogurt daily for 30 days but they didn’t show that How to take, in what quantity have to take, and how many times in a day i.e., whether once or twice a day. So I just want answers of all the above questions. Thanking you! Around 2 grams Akarakara root powder can be mixed in yogurt and should be taken in the morning (with breakfast) once a day. I have read on a health website that Akarkara and rai powder taken together with honey (twice daily) can recover hemiplegia. Is it genuine formula? If yes, please mention the quantity of the powder. The dosage described in the table is for one time. However, patient may require to repeat it twice daily.